Conventional Orthodontic Treatment is indicated for most children, and is best started when all of the permanent teeth have erupted, usually around the ages of 10-13. This treatment includes braces on all of the teeth, and can take anywhere from 12-30 months, depending on the alignment of the teeth. Two-Phase Orthodontic Treatment is indicated for those children who have a specific, more severe orthodontic problem noted at younger age. Treatment is performed in two separate phases. The first phase usually begins around the age of 8 and lasts for 12 months. This treatment often consists of braces on 4-6 top teeth and a palate expander. Once this treatment is complete, the braces are removed, the patient is given a retainer, and the patient goes on a “braces break.” Once all the permanent teeth have erupted, a second full set of braces is used to align the teeth. This second set of braces is usually 12-24 months. 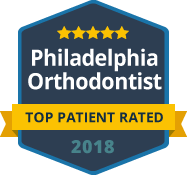 We at Broad Street Braces believe that ideal orthodontic treatment includes fantastic results AND an efficient, precise, path to those results. While most children benefit from conventional orthodontic treatment, only some children benefit from two-phase treatment. We are committed to keeping our patients in treatment for as short amount of time as possible and excellent results.